Blue Ridge Roller Girls Archives - Page 2 of 2 - io design & illustration, inc.
One of our favorite things to do in Asheville is cheer for our local women’s flat-track roller derby team, the Blue Ridge Rollergirls. 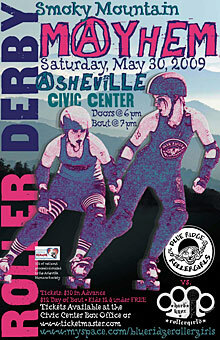 We were excited when presented with the opportunity to design the poster for their May 30, 2009 bout. Based around the theme Smoky Mountain Mayhem, this poster was a perfect chance to use some grunge fonts and fun PhotoShop effects. Trust us, one of the most fun things you can do in Asheville for under $20 is attend a bout. We hope to see you there.